Jokes about bad days at works are abundant on the internet. Time and again, employees complain about how they watch the time go by as they pray for the day to run out. Many also joke about their hatred for Monday mornings, and how much they resent the sound of their wake-up alarms. However, behind these jokes, there’s a fact that is no laughing matter. Many employees repeatedly experience bad days at work, the result of which is lowered performance. I stumbled on a research by Woohoo inc that x-rayed this problem and showed the extent to which this has become an issue. 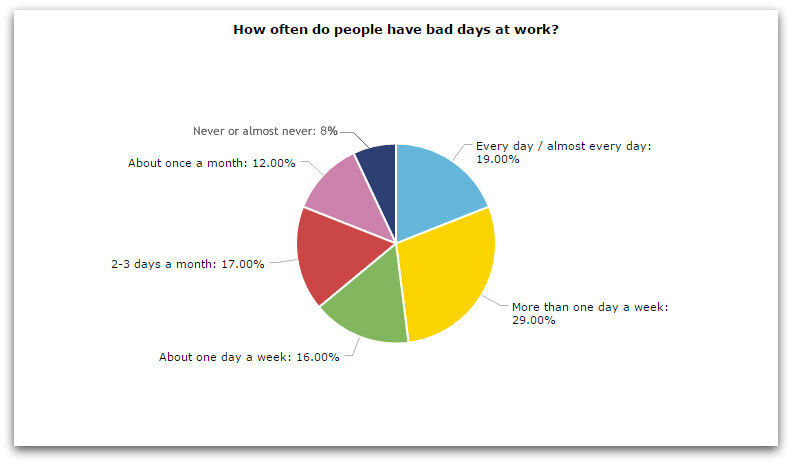 Of the 719 respondents, 19% said every day or almost every day is a bad workday. 29% said more than one day a week, and 16% said about one day a week is a bad day. In all, almost 2 out of 3 respondents have at least one bad day each week. The study also revealed some demographic information. For example, more Americans experience at least one bad day each week (68%) than Europeans (56%). Also, workers in the private sector reported more bad days (65%) than those in the public sector (61%). And apparently, no gender is less prone to bad days as men and women reported about the same amount of bad work days. Many may be quick to attribute bad days at work to problems in the employee’s personal life, but this report proves otherwise. In response to the question “The last time you had a bad day at work, was it bad because of factors at work or factors outside of work?”, 74.7% said it was factors at work, and 20.7% said it was a mix of both. 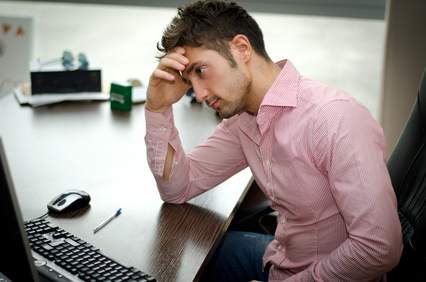 Just 2.8% blamed external factors for their bad work days. So while it is true that personal issues and attitude toward work could affect work experience, more often than not, when an employee has many bad work days, factors at works are responsible. This is the most highly reported reason (40%) for bad workdays. Of course it is the duty of a boss to call the shots (they certainly would not be called bosses otherwise), but a good boss can and should help out every now and then when a deadline needs to be met, or when it’s apparent that the workload is too much on employees, possibly due to some temporary spike in activity. One problematic coworker can seriously affect the relationships and interactions in the workplace. Since employees are expected to work as part of teams, they have to interact with coworkers on a regular basis, and if a few coworkers turn out to be toxic, others may begin to hate team meetings and discussions, and hate coming to work. In the survey, 39% of the respondents blamed negative workers for bad work days. Let’s face it, we all like being appreciated, being told our input matters, being recognized and rewarded. Children glow when they are praised by their parents. Parents feel deep warmth when they are openly appreciated by their children. Similarly, employees thrive, grow, and work better when they are told they were instrumental to the completion of this job and that project, and that their work is greatly appreciated. Conversely, an employee who works really hard but receives zero credit may lose morale, and when morale goes, it usually takes everything else along. Essentially, people need to know exactly why they are leaving their houses each day, what the company wants to accomplish, and the part they play in getting these things done. Understandably, company requirements and strategy will change from time to time, and in fact this is necessary for any company that wants to stay in business. However, if a company very frequently abandons work processes, tasks, projects, and policies half way through, employees may begin to lose interest in the job. With the current state of things, a strict 8 hour workday is utopian for a lot of workers. Many people have to work extra hours in the office and at home to meet up with deadlines. Those who are able to avoid overtime may yet be loaded with so many tasks, sometimes of varying nature, and they have to perform maximally or risk losing their jobs. The negative effects of such high workload can hardly be overstated. I know because I’ve been there. I was once so flooded with tasks that I had to work while commuting to work. As soon as I was settled in a vehicle, work began; I simply could not waste the 40-minute commute. On the way back, I worked just as much. And when I arrived home, I often worked into the night. I was able to keep this going for a while, but pretty soon, I was thoroughly exhausted. So while overloading employees with tasks can yield momentary benefits, in the long run it will impair employee performance, and possibly even make them hate coming to work. How Important Is Employee Happiness? A research conducted by the University of Warwick proved that happy employees are 12 percent more productive, and this is just one of many similar research works that have yielded the same conclusion.